I tend to use this ayah when one of the siblings has done something to the other – to make it ‘better’ i ask him/her to do something good for other – preferably something the other wants/likes (i.e. not just a hug and a sorry each time). 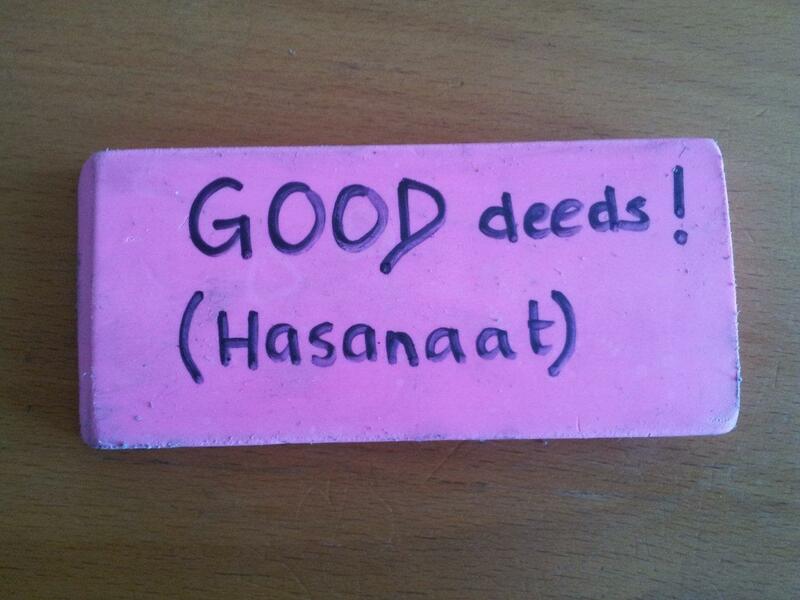 To make this concept visual for the kids, why not take an eraser and make it into a Good Deed Eraser. Write down in pencil what the mistake/bad thing was, and when they have done something good, rub it away with the eraser! This may also be a good way to show the children how MERCIFUL Allah is, as the 6th Imam has said that somebody who does something wrong has some time to repent. The angel who records good deeds asks the angel who records evil deeds to wait in case the person does a good deed which wipes out the bad one!